Definition at line 117 of file WebAssemblyExceptionInfo.h. Definition at line 129 of file WebAssemblyExceptionInfo.h. Definition at line 132 of file WebAssemblyExceptionInfo.h. 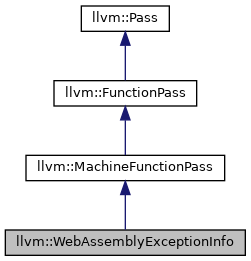 Definition at line 159 of file WebAssemblyExceptionInfo.h. References assert(), llvm::WebAssemblyException::getParentException(), and llvm::WebAssemblyException::print(). 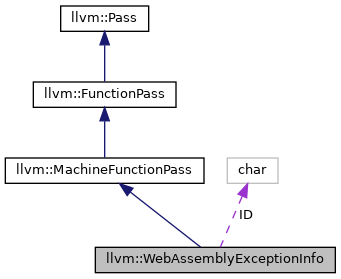 Definition at line 151 of file WebAssemblyExceptionInfo.h. Definition at line 143 of file WebAssemblyExceptionInfo.h. Definition at line 88 of file WebAssemblyExceptionInfo.cpp. References llvm::AnalysisUsage::addRequired(), changeExceptionFor(), llvm::MachineDominatorTree::dominates(), llvm::SmallVectorBase::empty(), llvm::MachineDominanceFrontier::find(), llvm::MachineFunctionPass::getAnalysisUsage(), llvm::WebAssemblyException::getBlocksVector(), llvm::WebAssemblyException::getEHPad(), getExceptionFor(), llvm::WebAssemblyException::getParentException(), llvm::WebAssemblyException::getSubExceptions(), llvm::SmallVectorImpl< T >::pop_back_val(), llvm::SmallVectorTemplateBase< T >::push_back(), llvm::WebAssemblyException::reserveBlocks(), second, llvm::WebAssemblyException::setParentException(), llvm::AnalysisUsage::setPreservesAll(), and llvm::MachineBasicBlock::successors(). Definition at line 147 of file WebAssemblyExceptionInfo.h. Referenced by getAnalysisUsage(), and recalculate(). Definition at line 182 of file WebAssemblyExceptionInfo.cpp. Definition at line 45 of file WebAssemblyExceptionInfo.cpp. References llvm::WebAssemblyException::addBlock(), addTopLevelException(), getExceptionFor(), llvm::WebAssemblyException::getParentException(), llvm::MachineBasicBlock::isEHPad(), llvm::post_order(), llvm::SmallVectorTemplateBase< T >::push_back(), and llvm::reverse(). Definition at line 82 of file WebAssemblyExceptionInfo.cpp. Definition at line 34 of file WebAssemblyExceptionInfo.cpp. Definition at line 128 of file WebAssemblyExceptionInfo.h.